WASHINGTON (AP) - A pickup game of basketball last spring brought good luck to the University of North Carolina's basketball team and to Barack Obama, the president said Monday as he welcomed the national champions to the White House. North Carolina won the title this year. And Obama, who scrimmaged with the players during a campaign visit to Chapel Hill, N.C., won the state's Democratic primary and then carried North Carolina in November as he captured the presidency. "I'm not sure whose luck rubbed off on who," Obama said Monday as he greeted the team on the White House's South Lawn. "I think there was just a good vibe going on there." Obama said almost everyone was excited to have the Tar Heels stop by. The one exception, he said, was his personal aide Reggie Love, who won a title as a player for UNC's chief rival, Duke. 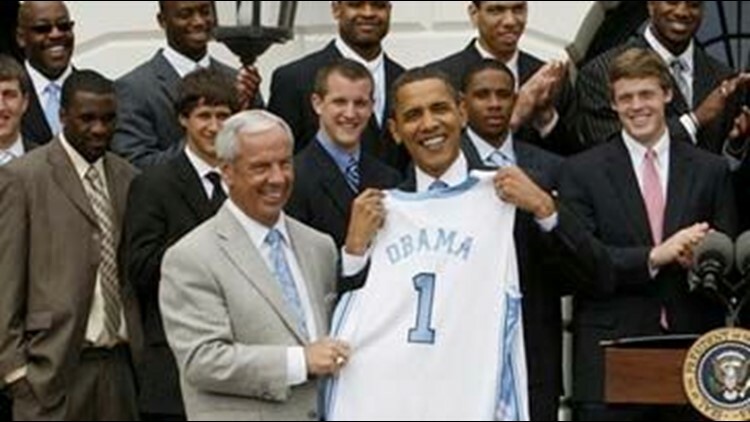 Obama picked North Carolina to win the national championship this year. He thanked them "for salvaging my bracket and vindicating me before the entire nation." The president's other picks for the NCAA tournament's Final Four never made it that far. Obama praised coach Roy Williams for instilling "the importance of academics into all these guys, which is why they didn't just plow through the tournament field; they also had the highest graduation rate of anybody in the Final Four." He said the team also engages in public service, such as holding basketball clinics for handicapped children.